Committee members present the check (from left to right): Jeffrey M. Fried, President & CEO Beebe Medical Center; Tom Crowley; Nick Caggiano; Beth Salaman, Event Coordinator Beebe Medical Foundation; Tillie McHugh; Dr. Frank Merolla, tournament Co-Chair; Jim Martin, tournament Chairman, and Cherrie Rich, Executive Director of Oncology Services at Beebe Medical Center. 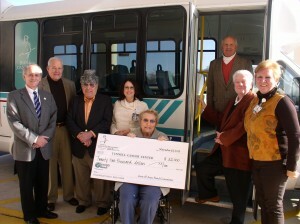 The JEAN & JOAN CANCER FUND donated $22,000 to Beebe Medical Center’s Tunnell Cancer Center for patient care services. The money was raised at the 13th Annual Jean & Joan Golf Tournament that took place in October 2012 at the Kings Creek Country Club. The JEAN & JOAN CANCER FUND, founded in 1999, has donated a total of $355,000 for cancer patient support at the Tunnell Cancer Center. All of these funds have been dedicated to assist the Sussex County community and patients afflicted with cancer. The annual Jean & Joan Golf Tournament has been a fundraising success over the years thanks to the support and contributions from local businesses, corporations, and individuals. They have included: SPI-Pharma Group, Kings Creek Country Club, Allegis Group Foundation, Drs. Paul and Frances Esposito, Ron & Tricia Ritthaler, Pat & Rita Gorman, Atlantic Theaters, Crowley Associates Realty, Beebe Medical Center, friends & family of Joan E. Martin, Bio-Med, M. & T. Charitable Foundation, Wells Fargo Advisors, Happy Locks Locksmith, Baker Petroleum, Jeanne Andrews family, Dr. & Mrs. Frank and Marybeth Merolla, and the staff & nurses at Tunnell Cancer Center. The 13th annual tournament was well attended and drew participants together as they supported cancer survivors and cancer care at Beebe Medical Center’s Tunnell Cancer Center. The team of C.W. Mitchell, Ralph Hamson, Cliff Parker, and Pete Nehrbas won the tournament for the first time with a net score of 18.1 under par. Sherry Pie had the longest drive and closest to the pin for women. John Darr narrowly missed the Hole-in-One contest for $20,000 and Joe Horvath the Putting contest for $10,000. In 2013, the 14th tournament will take place at Kings Creek Country Club on Tuesday October 1. Information about the tournament, business sponsorships and contributions can be obtained by contacting Jim Martin at JEAN & JOAN CANCER FUND, 18585 Coastal Hwy. Suite 10-151, Rehoboth Beach, DE 19971, or by calling (302) 226-1403 or faxing (302) 226-3856.